There are so many different elements that go into a circus themed birthday party and it can feel a bit overwhelming to work all of them into the mix. With a little planning and commitment to DIY, giving your child the circus-themed party of their dreams is easier than you think. Before you pick out a single decoration or activity for your circus-themed birthday party, you should begin by creating invitations. Having a circus-themed invitation will let your guests know exactly what to expect ahead of time. They should say something like, “The circus is coming to town to celebrate (child’s name)” and included circus themed imagery. There are many circus images you can include on your invitations but we love the idea of including a classic red and white tent. When you think about a circus, what’s the first thing that comes to mind? Chances are a circus tent just popped into your head. You can rent a big tent for the event. You can also use red and white streamers to decorate the inside and outside of the tent and make DIY centerpieces for each birthday table that are representative of the circus. You can include popcorn and peanuts on the tables to sell the idea of the circus coming to town for your child’s birthday. Circuses are always a blast because they include fun games and activities for everyone to take part in. New Joy Entertainment can provide you with all the activities you need. From bounce houses to pony rides to face painting, the activities that we offer will make your circus party so much fun. We will bring everything to you and put it wherever you want within your circus setup. You can also have a variety of DIY games in order to keep people that are waiting occupied. Blow up balloons, staple them to the board, and provide a plastic dart: instant circus activity! Outside of the popcorn and peanuts you put out on the tables, you should also serve classic circus foods like hot dogs, ice cream, cotton candy, homemade lemonade, and more. Luckily, most of these are easy to buy and make yourself! At the end of the circus party, you should also give away goodie bags filled with circus snacks and items that will remind everyone of the circus long after they’ve left your child’s party. We suggest filling them with circus peanuts, clown noses, lollipops, Cracker Jack popcorn, and more! New Joy Farm can provide you with plenty of circus-themed activities. 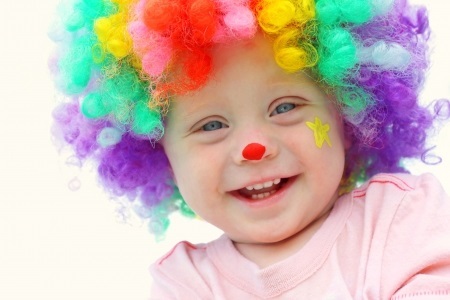 Contact us today to learn more about our pony rides, bounce houses, face painting, and more!